Please be informed that, SMI Association of Johor Selatan will organize its 2nd Networking Golf and Dinner on 8/9/2006 (Fri). at Palm Resort, Senai. 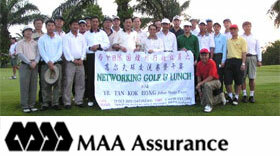 This year we are honored to have MAA Assurance Bhd being the main sponsor for our event. The main purpose of organizing this Networking Golf and dinner is for the SMI members and friends from different industries to mingle meet and have fun, network and foster closer relationship in a wider social context. All are encourage participating in this Networking golf and dinner. We hope that you will be part of us, if you however, not a golfer yet, we also welcome you to join and have dinner with us. Chinese set dinner is expected to serve at 7pm. Longest Drive , Nearest to Line & Nearest to Pin. For those who are interested, please reply us by sms 019-710 7680 (Kenny), 016-773 3378 (Ryan) or email: [email protected], [email protected], please forward your registration form and fees to us before 30 Aug 2006. Kindly issue cheque payable to “SMI Association of Johor Selatan. If you need any further clarification, please feel free to contact us. See you at Palm Resort Golf Country Club, Senai, Malaysia.